Near the end of the regular season, it looked like the Senators were going to plummet all the way into the 8th spot so this was a matchup I thought we’d be seeing in the first round. They stopped at 7 but never-the-less, we get the match up in the second round. I don’t really know if Ottawa was impressive in the first round of if the Canadiens just fizzled. I’ll go with my gut feeling and that feeling is that none of the teams in the Eastern Conference thrilled me through the first round so I guess Montreal just fizzled. Pittsburgh made a lot of mistakes against the Islanders and the Senators are a well-coached team. (Shouldn’t Paul MacLean be a slam dunk for the Jack Adams Award?) If Pittsburgh continues to make those mistakes in this round, the Senators might just eat them up. MIGHT!!! There are two that come to mind. The first has to be the Penguins goalie situation. I don’t see how you go back to Fluery at this point. Go with Vokoun and let Fluery sit and wait to see if Vokoun loses his edge. Vokoun replaced Fluery in the first round, went 2-0, made some HUGE saves in OT of Game 6 and got the Penguins through the first round. It would be an awkward conversation to have with him if the Penguins decided to go with Fluery. The second has to be the Matt Cooke/Erik Karlsson storyline. It’s an old, played-out story but you know that storyline isn’t going to go away or at least the media isn’t going to let it go. Sidney Crosby – He returned to the lineup in Game 2 of the first round and it’s hard to believe he wasn’t the dominating player we were expecting because I’ll take his stats any day of the week. (3G, 6A in 5 games). I don’t see him fading into the background as the guys around him do more, that’s just not his style. More ice time = getting more comfortable = the Sid we all a) love b)hate. Evgeni Malkin – <insert Jimmy Fallon butchering his name joke right here> I thought the Penguins put forth a pretty poor effort in Game 6 but the exception was Malkin. He looked like a man wanting to win and trying his hardest to do so. At one point, Malkin put his body in front of a puck that was sure to give the Islanders the lead late in the third period. If that Malkin shows up in this round, good luck to those Senators. Erik Karlsson – The best offensive defenseman in the league made it back from a torn Achilles in the final days of the regular season. He had one goal and five assists against the Canadiens which only tells half of the story. He’s so gifted and gives the Senators a chance every night. He’s mentioned on twitter that the Cooke incident is old news but don’t you think he’ll have something extra in the tank? 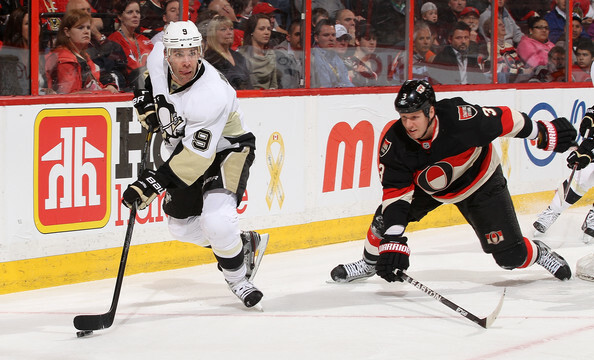 Craig Anderson – Despite what Karlsson brings every night, Anderson is the key. The Senators don’t score much so Anderson has to keep the Penguins out of the net as much as possible. The Penguins say they know the secret to beating Anderson so I guess we will so how that plays out. Hint – he’s weaker against left hand shooters. This series comes down to one position – The goalie. Can Pittsburgh stop letting in so many soft goals? I don’t feel very confident when it comes to the Penguins goalies. On the flip side, Anderson didn’t do so well against Pittsburgh this season (0-2-1, 2.66 GAA, .904 SV%) so I am not feeling very confident for him either. You watch, this series will become a shootout and should that happen, Ottawa doesn’t really have the firepower to match all those weapons in Pittsburgh. Senators can’t do much worse than the Islanders so I’ll go Penguins in 6. Make sure you pay attention to Eugene Melnyk’s twitter account during this series. I’m sure he’ll have some interesting things to tweet about.